- If you are selling stocks because of an "imagined" trade war, you're making a mistake. - If you are selling stocks because of the North Korea situation, you're making a bigger mistake. - This is an anxious market that cringes over every word spoken. It's all noise, stay focused on what matters. - The long-term bullish market trend remains in place, and that's what we continue to focus on. - This idea was discussed in more depth with members of my private investing community, The Savvy Investor. Global trade is the issue that market participants talk about most these days. Extremes, that is what makes a story. After all, not much excitement in a statement that says, trade talks continue. But that is what is happening. Instead, we get the journalistic spin that leaves us with the thought of global trade ending next Tuesday at 3 PM eastern standard time. That is followed by the thought of the financial system being tossed so out of balance, the stock of companies become virtually worthless. When it's stated like that it sounds ridiculous. Perhaps some analysts need to speak to a mirror before they start speaking to the masses. That brings me to fear, and those who decide to sell that to investors every chance they get. If a regular reader hasn't noticed, these articles usually have an inference to the fact that those marching around spreading fear, need to do so on a different planet. Let me come right out and say the words, they are doing the average investor a great disservice. That is not saying it's best to keep your head buried in the sand and ignore the issues and other opinions. To the contrary, the message here is always to look at all of the data and keep an open mind. Yes, the same message, repetitive and boring, I know, but the minute an investor decides they won't manage the equity market that way, they are lost. Anyone that has been invested during this bull market, which at times has been despised, has come to realize it is much better to see what develops first, then act. Problem is most of these purveyors of pandemonium highlight one data point, then proceed with an opinion. They fail to bring forth ALL of the facts. I leave this segment with the proclamation that the trade war that wasn't, is pure noise. A media fabrication of what is really taking place, wrapped around an agenda. Investors have already witnessed how bringing an agenda to investing is a sure way to commit financial suicide. A skirmish with ongoing negotiations might be a better way to describe what is actually taking place. Inflation is the 'boogeyman' for 2018 - at least that is what everyone is expecting. 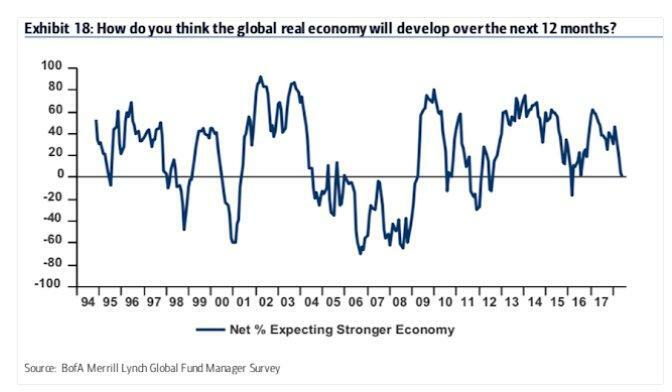 79% of fund managers expect higher inflation over the next 12 months; this is near a 14-year high. Commodity allocations are at a six-year high. In the past, this has corresponded with a fall in U.S. 10-year yields in the months ahead. A cautionary note. It's not wise to load up on these inflation-assisted groups now. While we are being told that inflation risks are elevated, that doesn't mean they have to occur to the extent that suggest being wildly overweight these groups. Proceeding slowly by adding some exposure now to these sectors is wise. Then it will be time to assess and reassess as the situation develops. The reports on PPI, CPI and the Fed's measure of inflation, PCE have pulled back and softened lately. I won't try to predict what may happen to the commodity picture down the road. I can say that it is now looking like a crowded trade with a lot of folks on one side of the boat. The second half of the year may be interesting when we look at what took place entering 2018. Hmm, there it was in plain sight again. Everyone was on one side of the boat on multiple fronts, and here is what happened. The stock market corrected, and is now in the midst of a four-month consolidation phase that is working off the excesses created in that buying frenzy. During this time, global equity allocations have fallen and cash balances have risen. Investors are no longer at a bullish extreme. In the past 9 months, U.S. equities have outperformed Europe by 6% and the rest the world by 5%. Despite this, fund managers continue to be underweight the U.S.
At some point, the out of balance situation regarding U.S. stocks will swing back to a more neutral stance. More evidence to support a view that while there are issues, when we start to gather facts, some of them do lead to a more positive outcome. Keep an open mind. The April Treasury report showed that April tax receipts not only set an all-time record, but were fully 12% higher than last April's receipts. The savings from producing in China have dropped to basically 0%, reflecting higher wages, higher energy prices and a stronger yuan. That's one reason why U.S. domestic capital expenditures (capex) relative to cash flow already have turned up. Combined with corporate tax reform and full expensing, capex in the U.S. should continue to increase, causing productivity growth to accelerate to 1.5% y/y, more than double its average growth rate over the past five years. The Leading Economic Index is up +6.4% year over year, the best pace since July 2014. In the past, this will go negative year over year right ahead of a recession. Yet another sign that there is no recession around the next corner. The flash May PMI surveys point to an encouragingly solid pace of economic growth of 2.5- 3% with monthly job gains running at just over 200,000, though the interesting action is coming on the prices front. Input costs measured across both manufacturing and services are rising at the fastest rate for nearly five years, with the goods-producing sector seeing the steepest cost increases for seven years in recent months. Furthermore, supplier delivery delays, a key forward-indicator of inflationary pressures, have risen to the highest seen in the 11 year survey history. Rising demand has stretched supply chains to the extent that suppliers are increasingly able to demand higher prices. At the same time, higher oil and energy prices are pushing up firms' costs. Business optimism meanwhile remains at a three-year high, with companies commonly expecting rising demand to help drive business growth, setting the scene for further strong survey results in coming months. New home sales came in at 662K vs. consensus of 677K, down 1.5% versus an estimate of -2.2%. Inventory is at a 5.4-month supply. The May PMI brought yet another set of disappointing survey results, though once again a note of caution is required when interpreting the findings. While prior months have seen various factors such as extreme weather, strikes, illness and the timing of Easter dampen growth, May saw reports of business being adversely affected by an unusually high number of public holidays. Furthermore, despite the headline PMI dropping to an 18-month low, the survey remains at a level consistent with the eurozone economy growing at a reasonably solid rate of just over 0.4% in the second quarter. Job creation is also continuing to run at an encouragingly robust rate and optimism about the business outlook remains above its long-run average. Despite the promising upturn in April data, May's flash release erred on the side of disappointment as the headline figure signaled the weakest expansion in manufacturing growth in nine months. Employment growth eased, in line with a weaker accumulation of work backlogs due to softer demand pressures. That said, new export sales expanded faster amid the recent dollar strength vs. JPY. However, there was further evidence that supply-side constraints may be impacting output potential, as material shortages contributed to the greatest lengthening of delivery times in seven years. Consequently, input prices soared at the fastest pace in 52 months. It was a mixed bag this week. The U.S. continued to post results that point to a gradual ramp to a 3% GDP number. 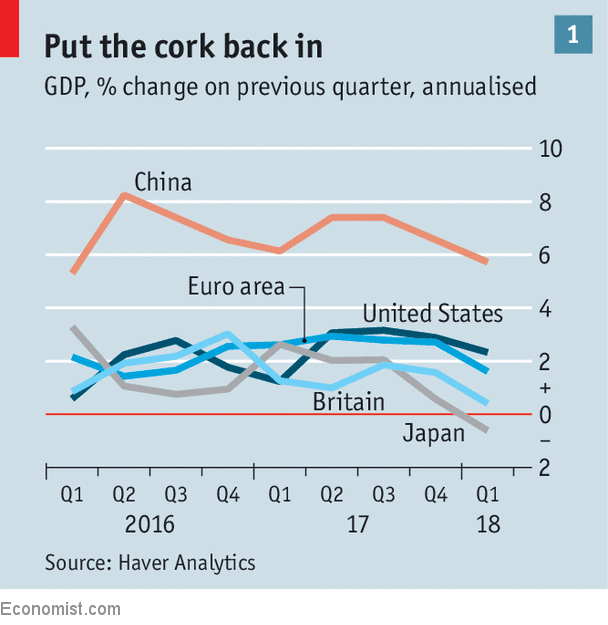 While one report does not make a trend, the eurozone and Japanese reports have been weaker of late, indicating the economies have at the very least plateaued. Whether we will see more deterioration or a leveling off of the data remains to be seen. It's something to keep an eye on. In the FactSet Research Weekly update for Q1 2018, 97% of the companies in the S&P 500 reported actual results for the quarter. 78% of the S&P 500 companies have reported a positive EPS surprise and 77% have reported a positive sales surprise. If 78% is the final number for the quarter, it will mark the highest percentage since FactSet began tracking this metric in Q3 2008. Earnings Growth: For Q1 2018, the blended earnings growth rate for the S&P 500 is 24.6%. If 24.6% is the actual growth rate for the quarter, it will mark the highest earnings growth since Q3 2010 (34.0%). Valuation: The forward 12-month P/E ratio for the S&P 500 is 16.4. This P/E ratio is above the 5-year average (16.2) and above the 10-year average (14.3). This week we heard that the trade war was on hold. All I can say is: What trade war are these people talking about? I guess I slept through this event. Funny how folks extrapolate issues to extremes and worst possible outcomes, then believe it to be happening. When I see a headline like this, I ask again: What trade war? A skirmish with ongoing negotiations might be a better way to describe what's actually taking place. Let's apply some common sense, please. Participants expressed a range of views on the amount of further policy firming that would likely be required over the medium term to achieve the Committee's goals. Participants indicated that the Committee, in making policy decisions over the next few years, should conduct policy with the aim of keeping inflation near its longer-run symmetric objective while sustaining the economic expansion and a strong labor market. Participants agreed that the actual path of the federal funds rate would depend on the economic outlook as informed by incoming. Inflation temporarily above 2% could be helpful. A few participants commented that recent news on inflation, against a background of continued prospects for a solid pace of economic growth, supported the view that inflation on a 12-month basis would likely move slightly above the Committee's 2 percent objective for a time. It was also noted that a temporary period of inflation modestly above 2 percent would be consistent with the Committee's symmetric inflation objective and could be helpful in anchoring longer-run inflation expectations at a level consistent with that objective. 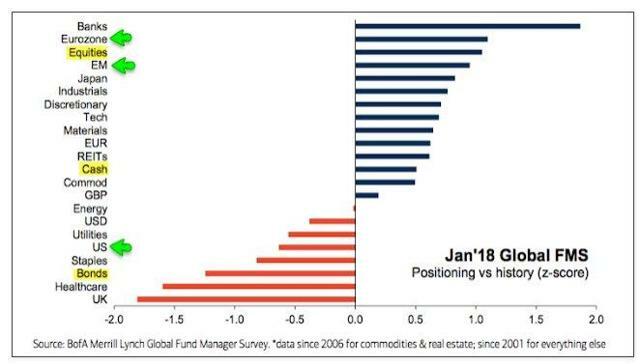 Nine of every 10 money managers have only known an environment of secularly declining yields, a downtrend that intersects with 3.25% on the 10-year, with resistance at 3.06%. This is feeding a 'this is it!' mentality. Monetary policy is far from restrictive, European and Japan central banks are still expanding their balance sheets. Current market expectations see the federal funds target rate gradually reaching 3-3.25%, making for a flat curve in 1-1.5 years. Recessions typically don't occur until a year or two after an outright yield-curve inversion (short rates above long rates), with the market rallying in the interim. There's less than a full month between now and the next FOMC meeting, but no sooner than one meeting passes does the market quickly shift its attention to the next meeting - especially now that we are in the middle of a hiking cycle. The market continues to price three hikes this year as being the most likely (two more). As expectations for an FOMC rate hike in June remain in place, yields along the U.S. treasury curve have been on the rise with the short end of the curve seeing the biggest increases. The two-year yield is up above 2.5%, while the 10-year yield briefly topped 3% and then pulled back. It is unnecessary to press policy rate normalization to the point of inverting the yield curve since inflation and inflation expectations are either at or below target. Remember how the end of QE was supposed to end the bull market? Surely when the Fed starts winding down its balance sheet that will be the equivalent of tightening and stock ownership won't be the place to be. It's nice to hear those opinions, but here is a fact to now consider. The Fed has reduced its bond holdings by $100 billion since the end of September. The S&P is up 10%, the Nasdaq +15%. 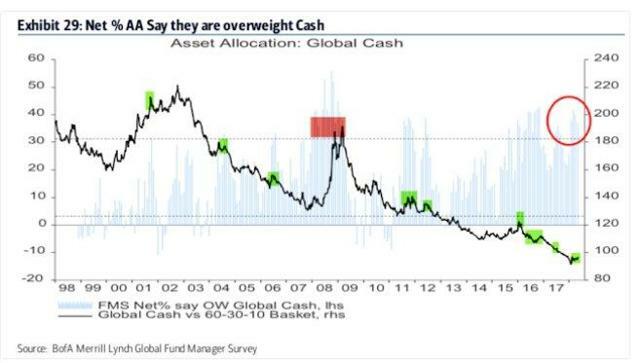 Fund managers are a net +37% overweight cash (+1.4 standard deviations above its long-term mean). That is something seen at market lows. Another contrarian sign regarding the global economy. The ongoing trade war commentary and the thought that the U.S. economy is way overdue for a recession is more than likely responsible for the results in the following survey. Macro expectations have fallen hard in recent months. 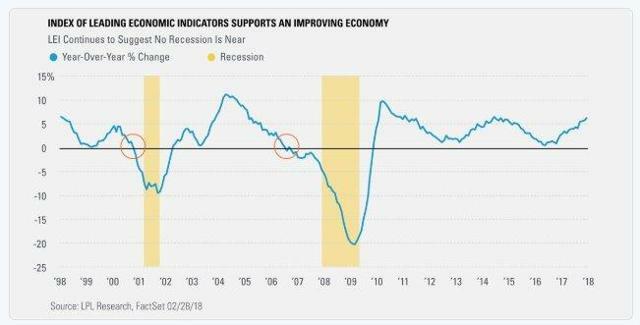 Only a net 1% expect a better economy in the next year, the lowest since equities bottomed in early 2016, down from a net 47% in January 2018. Investors are now relatively bearish on the global economy. Individual investors are showing more bullishness than last week. According to the weekly survey from AAII, bullish sentiment increased this week from 36.6% up to 38.5%. That's the third straight weekly increase, and also marks a higher high in bullish sentiment versus the mid-April high. Keeping the report in perspective, bullish sentiment remains well below 50%. While higher oil prices also could trim consumer spending, Strategas Research estimates they'd have to average at least $86 for the year to wipe out the tax-cut boost to incomes. With the price of crude oil falling at the end of the week, it appears we won't have to be concerned about $80 oil just yet. The weekly inventory report showed an increase of 5.8 million barrels in the past week. Gasoline inventories also rose by 1.8 million barrels. The oil market saw profit taking this week, as WTI closed at $67.69, down $3.68. Consolidation mode continues with a twist this week. 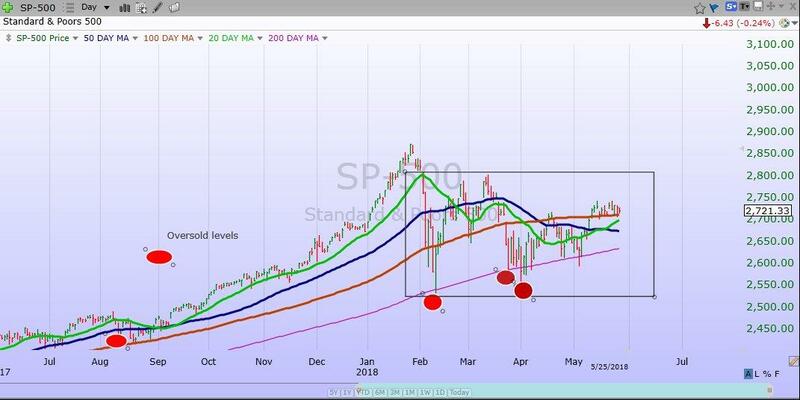 Since the last low that was recorded on May 3, the S&P has made a series of higher highs. The latest was on Monday when the index closed at 2,733. During that trading day, there were 283 new highs compared to just 21 new lows. We also note that the index closed today at 2,721; back on Feb. 15, the index was 2,731. So, despite what we perceive is taking place with the headlines on any given day, the market is meandering along in what really is a trend less fashion. A typical consolidation pattern. The technical picture shows no signs that would cause me concern. Not only do I see that in the S&P 500, I take my cues from the charts of the other major indices as well. The Dow Industrial is also riding along a support level. The Dow Transports, often thought of as a good tell on the economy, just broke above a resistance level that was in place since February. Add in the fact that the Russell 2000 made a new closing high this week, that tells us that the rally is very broad, and the major indices are in sync. When that happens, it presents a very strong bullish signal. Consumer Staples continues as the worst YTD performer. Quite the Opposite for Consumer Disc. (driven by Amazon (NASDAQ:AMZN)). Energy has now taken over as the leader for the year. 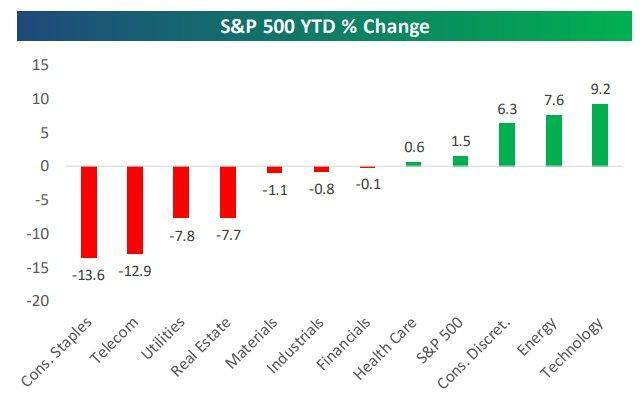 The Energy sector is up 15+% in Q2. Crude Oil is now up 20+% for the year. Despite the sell off in energy stocks at the end of the week, I am not inclined to abandon this trade. Perhaps this is just a pause in what has been a big move higher. The AP reported that Congress has voted to approve legislation scaling back the Dodd-Frank law, a framework for banks that was put in place to prevent a recurrence of the 2008 financial crisis. The roll back, which was promised by President Donald Trump during his campaign, raises the threshold at which banks are deemed so big and significant to the financial grid that if they were to fail it would cause chaos. Banks deemed this big are subject to stricter capital and planning requirements and supporters of the legislation sought to ease the restraints on them, arguing it would increase lending and boost the economy. The Financial sector remains undervalued. As shown below, Technology leads the way with a gain of 9.2% on the year, but the Energy sector is not far behind at this point with a gain of 7.6%. Remember, at the end of the first quarter on March 29th, the Energy sector was down 7% on the year. The industrial sector is an area that I believe will be next to get back on track. All that is required is patience as the cyclical sectors should begin to perk up. Some solid industrial companies were tossed away due to fear over the trade issues. As we have now seen, this trade issue does not have the bite that the associated bark might suggest. Valuations look attractive, the forward P/E multiple for the S&P 500 sits much closer to its pre-Brexit floor (15.9) than its ceiling (17.4) - and technicals have turned favorable. The triangular pattern in the S&P and Dow has broken to the upside, with the S&P above its 100-day moving average and the cumulative advance/decline line setting a new high, a sign of internal market strength. Intermediate-term momentum indicators are incrementally turning up, sentiment indicators are oversold after peaking early this year, overall participation is improving across most sectors and the small-cap Russell 2000 index has set fresh 52-week highs. In addition, the average intra-day range for the S&P has narrowed by roughly half this month to levels historically associated with a low probability of a correction. With no scheduled events prior to mid-June's Fed meeting to disturb this quiet period, the current path of least resistance leads to higher share prices. Intermediate-term momentum indicators are incrementally turning up, sentiment indicators are oversold after peaking early this year, overall participation is improving across most sectors and the small-cap Russell 2000 index has set fresh 52-week highs. In addition, the average intra-day range for the S&P has narrowed by roughly half this month to levels historically associated with a low probability of a correction. With no scheduled events prior to the mid-June Fed meeting to disturb this quiet period, the current path of least resistance leads to higher share prices. Following the Fed's meeting, several business surveys indicated activity was off recent peaks last quarter but remains firmly in expansionary territory, whereas the non farm payrolls report showed employers hired 164,000 workers in April, missing expectations but roughly in line after prior months revisions. The report also showed largely in line inflation readings, including data on wage growth. When I look around and use some common sense, I see underlying earnings and economic fundamentals remain favorable, thus, the market has a reason to find a firm footing at these levels and begin a more favorable upward trend. The level of volatility being experienced over the last several months is actually the type that occurs in a more normal market environment. The low level of volatility in the several years leading up to 2018 were the abnormal ones. The probabilities favor an eventual upside breakout from the current trading range. Given the economic and earnings backdrop, pullbacks should be viewed opportunistically. Keep it simple, step back and apply common sense to the agenda ridden noise that persists, and stay the course. IN 2017 the global economy broke out of a rut. It grew by 3.8%, the fastest pace since 2011. Surging animal spirits accompanied a rebound in business investment across the rich world. Global trade growth rose to 4.9%, also the fastest rate since 2011. Emerging-market currencies appreciated against the dollar, keeping inflation low and debts affordable. Financial markets wobbled in February, but only after reaching all-time highs. In April the IMF said that the global economic upswing had become “broader and stronger”. Since then that healthy glow has begun to fade. First, economic surveys in Europe took a turn for the worse (presaging growth in GDP of only 1.6%, annualised, in the first quarter). Then the rest of the world seemed to catch the same cold (see chart 1). In the first quarter America’s growth slowed to 2.3%, annualised, from close to 3% in the preceding six months. At the same time, Japan’s economy shrank by 0.6%, ending a growth spurt sustained since the start of 2016. Investors have begun to wonder if the period of global exuberance is over. Even policymakers in China, which has seemed relatively immune to the slowdown, have taken note of weakening domestic demand. In mid-April they loosened monetary policy slightly by allowing banks to hold fewer reserves. Meanwhile, the slow upward march of American bond yields—the result of expectations of higher inflation and interest rates—has turned the screw on emerging-market currencies, which have fallen by 5.4% since the start of April (see chart 2). A run on the peso has forced Argentina to ask for an IMF bail-out and raise interest rates to 40%. The Turkish lira has also taken a beating, in part because the president, Recep Tayyip Erdogan, says that low interest rates reduce inflation (see Buttonwood). On May 15th he promised to take more control of monetary policy after the upcoming election. Make no mistake: world growth has slowed, but it remains strong. Surveys of activity in China, America and Europe are, when combined, higher than they have been 83% of the time over the past decade, according to UBS, a bank. Poor weather may have depressed European growth in early 2018. America’s economy often seems to slow early in the year, only to rebound, a phenomenon dubbed “residual seasonality”. Strong retail sales and high consumer confidence suggest that if a downturn is coming, Americans have missed the memo. In a way, however, that is part of the problem. Demand is piling up where it is least needed. American core inflation, which excludes volatile food and energy prices, is now 1.9%, according to the Federal Reserve’s preferred measure. That is only just below the central bank’s target. And the economy has yet to feel the full impact of the tax cuts and spending rises President Donald Trump recently signed into law. Outside America, however, inflation is falling short almost everywhere. In the euro zone it is only 1.2%, no higher than at the end of 2016. The Bank of Japan recently abandoned its pledge to raise inflation to 2% by fiscal year 2019—a target it had already postponed six times. Inflation in most emerging markets has been subdued, too. Even in Brexit Britain, where a big fall in the pound pushed inflation well above the 2% target in 2017, it has tumbled more quickly than expected. In theory, the world economy would be better off if this demand were spread around. Unfortunately, the mechanism that could achieve that is a dangerous one: a stronger dollar. In theory a rising greenback should allow Americans to buy more imports, stimulating foreign economies. 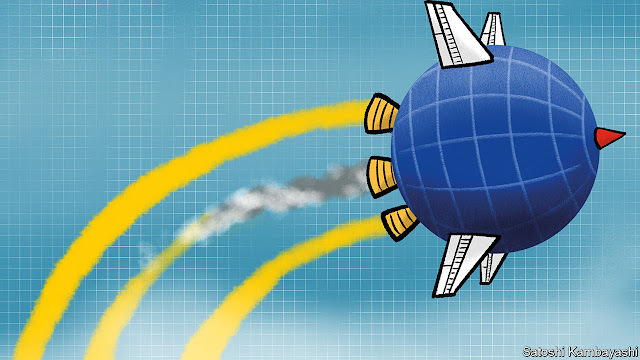 In practice a rising dollar can play havoc with emerging markets that have dollar debts. And because so much trade is invoiced in dollars, a stronger American currency reduces trade between other countries, too. Four of the past five Fed tightening cycles have eventually triggered a crisis in emerging markets. Yet there are reasons to be more confident this time. Among the ten largest emerging markets, only Turkey and Argentina ran current-account deficits greater than 2% of GDP in 2017. Most have dollar debts that are comfortable compared with the size of their economies. Another threat talked up by bears is the oil price, which has risen to close to $80 a barrel. They think this will push inflation up further, forcing higher interest rates. But the Fed usually ignores temporary inflation driven by energy prices. And predicting the impact of oil prices on the world economy has become trickier than it was before the shale revolution. Pricier oil now tends to boost American investment. In any case, it is driven at least partly by demand, reflecting healthy growth. The biggest risk to the world economy remains the possibility of a trade war. Mr Trump is negotiating with China and others with the aim of closing America’s trade deficit. That is difficult to square with a rising dollar sucking in imports. 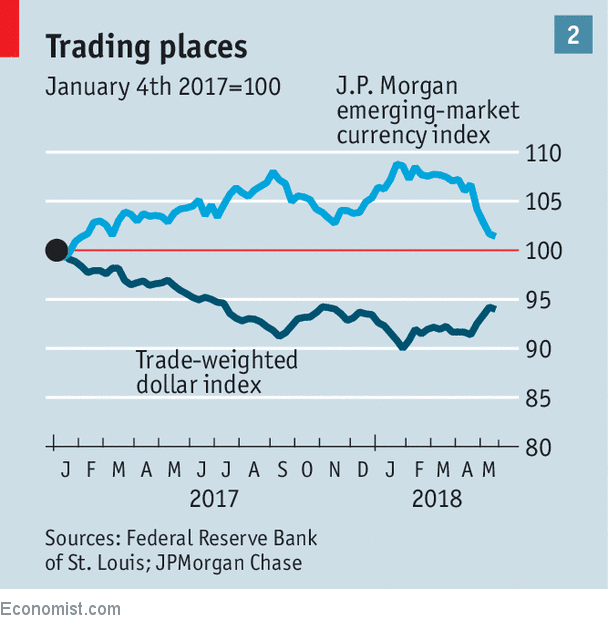 The danger is that slightly slower global growth, combined with ongoing stimulus in America, lays bare this problem and further provokes Mr Trump’s protectionism. That could set off a downturn that would really be worth worrying about. Financial crises always start the same way. Loose monetary policy leads to an increase in debt and a rise in risk-taking. Over-confident financiers, lax regulators and politicians desperate to please voters operate in this toxic environment until a bubble eventually bursts, taking the financial system down with it. I am not saying we are heading for this fate in the very near future. But it is worth noting that this coming week the US Congress may very well pass a bill to rollback the post-financial crisis-era Dodd-Frank reforms. This is happening at a time when interest rates have been at historic lows for nearly 10 years, public and private debt is at record levels, consumer debt loads and subprime defaults are rising, and politicians are looking to throw a bit more kerosene on the economy to seduce voters in the run-up to November’s midterm elections. The bill, authored by Mike Crapo, the Republican head of the Senate banking committee, is being couched as a way to reduce onerous regulatory burdens on regional and community banks so that they can do more of the plain vanilla lending — to farmers, or young couples looking to buy a home — that plays well at the ballot box. Yet the numbers show that loan growth at community banks is already stronger than the industry average (up about 8 per cent a year for the past two years) led by growth in commercial real estate loans, residential mortgages and commercial and industrial loans. A report released last week by the New York Federal Reserve, found that there has been a complete recovery in US housing wealth or equity since the 2008 crisis. But at the same time, housing market dynamics have also changed substantially. Nearly all of the rewards have gone to the richest and most creditworthy borrowers, while the number of younger people moving from renting to owning has declined precipitously. While tight credit is part of the problem, Beverly Hirtle, the executive vice-president of the New York Fed, notes that the underlying issue “seems to be the increase in other forms of debt — notably student loans — among younger borrowers with lower credit scores”. Encouraging these types of borrowers to take on housing debt, even if they were inclined to, obviously will not help growth or financial stability. Meanwhile, the bipartisan group of Congress members who are pushing the bill forward is downplaying the fact that it offers two important carrots for larger banks with assets ranging from $250bn to more than $2tn. These institutions will now be able to reclassify municipal bonds as “high quality assets”, making it easier for them to game the liquidity coverage ratio. Custodian banks, such as State Street, BNY Mellon and Northern Trust, will also benefit from a softening of post-crisis capital standards. They will be allowed to deduct client cash from their leverage calculations — something that could benefit even large banks such as Citigroup or JPMorgan that have custodial business. Rolling back these particular rules is not going to trigger a crisis. The US banking industry is better capitalised than it was in 2008. The next big market debacle is more likely to emanate from the corporate world than from banks. Even so, this “reform” bill takes us in exactly the wrong direction, at precisely the wrong time. As experts such as Tom Hoenig, former vice-chair of the Federal Deposit Insurance Corporation, have pointed out, there is ample research to show that banks with higher capital levels lend more, not less. Even an equity-to-assets capital ratio of 15 per cent (about triple what institutions must hold today) significantly reduces the risk of bank failure, with only a small increase in lending costs. Now would be a good time to raise capital standards on safe haven banks that sit at the centre of the capital markets, rather than lower them. It is always a good idea to have a cushion before the next crisis comes. This bill will do just the opposite. It will also roll back the Volcker rule prohibitions on proprietary trading done by banks with less than $10bn in assets. It is true that those institutions rarely gambled before. But in an environment in which bank margins are likely to remain compressed for a variety of reasons (including weak demand and competition from lower-priced Silicon Valley rivals), will even smaller institutions resist the temptation to reach for higher yields in the future? I doubt it. The latest Dodd-Frank rollback bill comes, of course, at a time when financial deregulation efforts are also gaining steam at the Treasury, the Securities and Exchange Commission, the US Federal Reserve, the Office of the Comptroller of the Currency, the Commodity Futures Trading Commission and so on. Is this where we want to be at the end of a recovery cycle, with debt loads at record levels and the interest rate environment changing? No. Sadly, short memories and rollbacks of post-crisis reform are another common refrain in financial history. NEW HAVEN – The cryptocurrency revolution, which started with bitcoin in 2009, claims to be inventing new kinds of money. There are now nearly 2,000 cryptocurrencies, and millions of people worldwide are excited by them. What accounts for this enthusiasm, which so far remains undampened by warnings that the revolution is a sham? As the medium of exchange throughout the world, money, in its various embodiments, is rich in mystique. We tend to measure people’s value by it. It sums things up like nothing else. And yet it may consist of nothing more than pieces of paper that just go round and round in circles of spending. So its value depends on belief and trust in those pieces of paper. One might call it faith. Two years later, Robert Owen, sometimes described as the father of socialism, attempted to establish in London the National Equitable Labour Exchange, relying on labor notes, or “time money,” as currency. Here, too, using time instead of gold or silver as a standard of value enforced the notion of the primacy of labor. But, like Warner’s time store, Owen’s experiment failed. Likewise,Karl Marx and Friedrich Engels proposed that the central Communist premise – “Abolition of private property” – would be accompanied by a “Communistic abolition of buying and selling.” Eliminating money, however, was impossible to do, and no Communist state ever did so. Instead, as the British Museum’s recent exhibit, “The Currency of Communism,” showed, they issued paper money with vivid symbols of the working class on it. They had to do something different with money. During the Great Depression of the 1930s, a radical movement, called Technocracy, associated with Columbia University, proposed to replace the gold-backed dollar with a measure of energy, the erg. In their book The A B C of Technocracy, published under the pseudonym Frank Arkright, they advanced the idea that putting the economy “on an energy basis” would overcome the unemployment problem. The Technocracy fad proved to be short-lived, though, after top scientists debunked the idea’s technical pretensions. But the effort to dress up a half-baked idea in advanced science didn’t stop there. 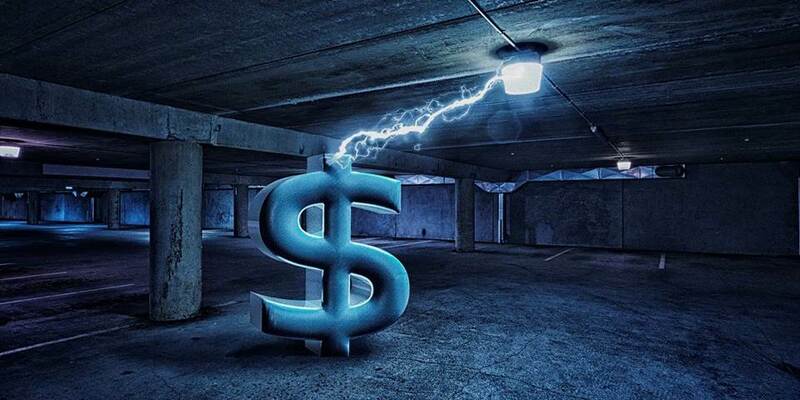 Parallel with Technocracy, in 1932 the economist John Pease Norton, addressing the Econometric Society, proposed a dollar backed not by gold but by electricity. But while Norton’s electric dollar received substantial attention, he had no good reason for choosing electricity over other commodities to back the dollar. At a time when most households in advanced countries had only recently been electrified, and electric devices from radios to refrigerators had entered homes, electricity evoked images of the most glamorous high science. But, like Technocracy, the attempt to co-opt science backfired. Syndicated columnist Harry I. Phillips in 1933 saw in the electric dollar only fodder for comedy. “But it would be good fun getting an income tax blank and sending the government 300 volts,” he noted. Just next door is Colombia, a country that stands out in South America for not having had a left-wing populist leader in over three decades. It also has an economy poised to challenge Argentina as the second-largest on the continent. With all that Colombia and Venezuela share, geographically and historically, this divergence is striking. The Colombia-Venezuela border is one of the few places in South America without geographic barriers delineating national boundaries. To the north, they share a sliver of lowlands. Both have expansive shores along the Caribbean Sea. Just south, the Andes extend from Colombia into Venezuela. Below that, the Orinoco Basin stretches from southeastern Colombia into central Venezuela. Their geographic similarities create an expectation that they would have similar natural advantages and disadvantages. Except that Venezuela has a lot of oil. The U.S. Energy Information Administration believes that at 307 billion barrels, Venezuela has the most reserves in the world. It funded the country’s economic development in the 20th century and into the 21st century. The oil business was so profitable that by the end of the 1920s, less profitable activities – even essential ones like agriculture – started to wither away. Today, the government depends on oil for about half its revenue. More than that, the government depends on oil for its own popularity. When oil prices are high, as they were early in Chavez’s presidency, populist measures like high welfare spending are manageable. But when prices crash, they can bring down governments. The low prices of the ‘80s necessitated the austerity of the ‘90s, which Chavez capitalized on just as prices were rebounding. In mid-2014, just over a year after Chavez’s death (Maduro was his vice president), oil prices started to fall, and Venezuela has been unstable ever since. Colombia was not blessed with Venezuela’s enormous oil reserves (though it has modest reserves of its own), something that forced the country to diversify. To help industrialize the country, the government resorted to import substitution, a policy in which the government heavily subsidizes and protects domestic industries from more advanced foreign competition so that they can grow. Industrialization and, later, services became a large part of the Colombian economy, but unlike in Venezuela, they didn’t drown out other economic activities. In addition to its modest oil reserves, Colombia has some of the largest coal deposits in the world and arable land capable of growing cash crops like coffee. Furthermore, oil didn’t become lucrative for Colombia until the 1980s. The absence of major discoveries in recent years has kept oil an important part of Colombia’s economy but never induced the government to abandon a more balanced approach to economic development. Besides their differences in natural resources, Colombia and Venezuela had vastly different experiences under Spanish colonialism, which shaped their respective visions for independence. Both Venezuela and Colombia were part of Spain’s New Granada colony. (And then, for a little over a decade, present-day Colombia, Venezuela, Ecuador and Panama formed the independent country of Gran Colombia.) In the latter half of the 18th century, Spain decided to divide its American holdings into smaller organizational territories to more efficiently govern and exploit the colonies. Venezuela was given more autonomy and military authority. And because Venezuela’s location makes it one of the first major points of contact with incoming ships on the Atlantic, it had more contact with Europe than other colonies. Colombia, meanwhile, was primarily used as a source of gold and other commodities bound for Spain. Its riches were heavily exploited, its outside interactions were more limited, and it had less autonomy than its neighbor to the east. The initial fight for independence began with a military junta in Caracas and revolved around Simon Bolivar’s vision for a pan-American state. Bolivar’s political model combined monarchy, republicanism and federalism in an attempt to find the right balance between control, stability and unity. He feared that introducing too much liberty to uneducated masses would result in anarchy and thus believed in the necessity of a strong central authority. These were the views of a man raised in the Caracas elite. On the flip side, Colombia generally favored federalism immediately after independence, calculating that centralized control was too similar to the central control of Spain. After independence, Colombia endured more than a century of disruptive competition between its liberals and conservatives. During a period known as La Violencia (1946-1958), political violence displaced the rural poor, who took up arms to try to defend themselves from constant aggression. These initial rural uprisings gave way to the Revolutionary Armed Forces of Colombia, or FARC, and started a domestic conflict that would last over 50 years. Since then, the Colombian government has focused primarily on bringing peace to the country. This is a cause that transcends political parties and therefore has stifled extremism and prevented left-wing populists from arising. Venezuela was living with its own kind of violence. In its first decades of independence, various strongmen fought for the right to rule. This culminated in the dictatorship of Juan Vicente Gomez from 1908 until his death in 1935. The next 15 years featured a series of coup attempts as political activists tried to introduce democracy to the country. Democracy was finally established in Venezuela in 1958, and since then, the staying power of any government has been intricately linked to the performance of the economy, which essentially means oil prices. Despite their comparable geography and similar origins, forces guided both Caracas and Bogota toward economic management and political structures that are very different from one another. Venezuela has been set in a cycle of boom or bust with its problems buried too deep – both in its history and quite literally underground. Meanwhile, Colombia’s need to bring about domestic political stability after decades of infighting and to seek a more measured approach to economic development has created a comparatively less volatile political and economic system. The 10-year Treasury yield has been the topic of conversation lately among fixed-income investors. Earlier this month, the T-note closed above 3 percent for the first time since July 2011, prompting some market watchers to call time on the three-decade Treasury bull market. (Bond prices fall as yields rise, and vice versa.) For other investors, these concerns might extend into the $3.8 trillion municipal bond market. I believe this bearishness is premature. Take a look at the chart below, which shows the 10-year yield’s daily standard deviation based on 10 years’ worth of data. 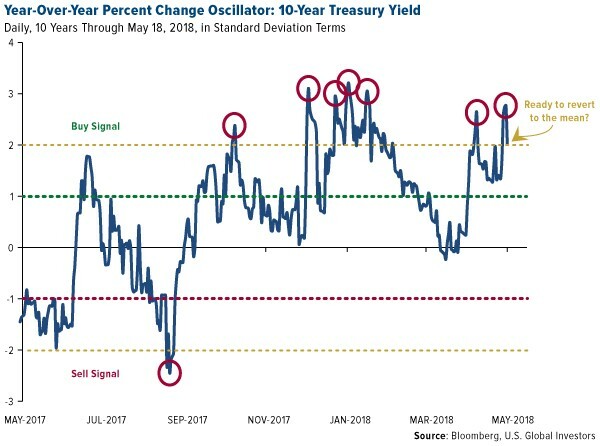 As of Friday, May 18, the yield was up a little more than two standard deviations from its mean—suggesting that, while not guaranteed, there’s a high probability of mean reversion. Such a move would bring the 10-year yield back down to around 2.88 percent, a level last seen in mid-April. This would be similarly positive for muni bonds, though it’s important to remember that Treasuries, unlike munis, are backed by the full faith and credit of the U.S. government. Fixed-income investors might find munis more attractive than Treasuries right now for two additional reasons. For one, muni bonds historically outperformed and were less volatile than Treasuries during previous rate hike cycles, according to Standish data. In the past, a 100-basis point rise in the 10-year Treasury yield—in response to higher interest rates—was accompanied by a rise of only 60 basis points on average in muni bond yields. Take a look below. 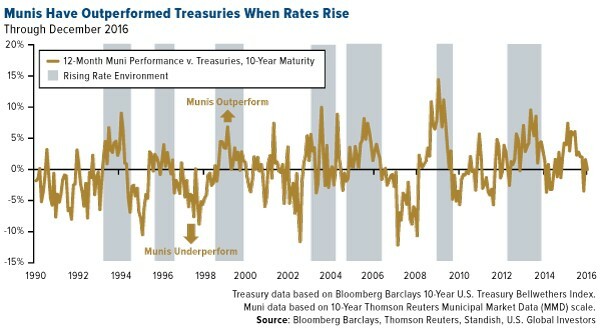 In each of the past seven rate hike cycles, munis outperformed Treasuries by at least 5 percent and sometimes as much as 10 percent or more. The Federal Reserve has raised rates six times since December 2015, with two more increases possibly slated for this year. Second, because muni bonds are exempt from federal income taxes and often from state and local taxes (SALT) as well, they’re especially attractive to investors living in high-income tax states such as California, New York, New Jersey, Minnesota, Oregon and others. You might think that the major tax reform bill signed into law at the end of last year would dampen demand for munis. But because the law caps SALT deductions at $10,000, wealthier taxpayers, in many cases, may end up paying more to Uncle Sam than they did before. Some high-tax states are scrambling to create “SALT workarounds,” designed to help top earners cope with the new tax law and prevent talent from migrating to a state with lower (or no) income taxes. The problem with these workarounds, though, is that many of them are highly complex. What’s more, filers may run into difficulties with the Internal Revenue Service (IRS), which has expressed disapproval of the workarounds. You can probably tell where I’m going here. Short-term muni bond funds are a tried-and-true method to help preserve capital and also deliver income that’s tax-free at the federal and often state and local levels.